Bike-sharing certainly has had an impact on urban cycling. Anyone living in a city with a medium to large bike-sharing program could tell you more people are cycling now than before. But just how much is this impact? We need to have a better understanding of this. Cities gauge cycling by measuring cycle "mode share" or "mode split". 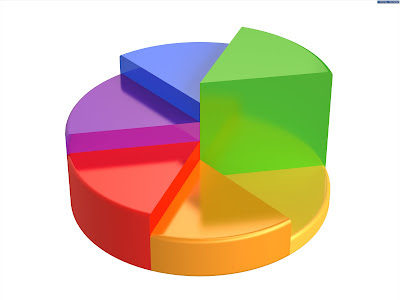 This is a percentage of all transport trips which are made by cycles. Some cities already have calculated this since bike-sharing has been set loose in their jurisdiction. Barcelona measured its cycle mode share in 2005 (before bike-sharing) and in 2007 (after Bicing launched) to find cycle mode share jumped from 0.75% to 1.76% (Source: Romero 2008). In Paris, cycle mode share increased from about 1% in 2001 to 2.5% in post-launch 2007 (Nadal 2007, City of Paris 2007). Based on these two cities, it appears that bike-sharing has the affect of raising bike mode share between 1.0 - 1.5% in cities with pre-existing low cycling use. While this may sound small, these percentages equate to tens of thousands more cycle trips each day. With over 100 bike-sharing programs internationally, there's data out there now which tells more about the story of bike-sharing in cities. The Bike-sharing Blog is asking for your help: Are you familiar with a report that shares your city's cycle mode share data before and after a bike-sharing program was implemented? Perhaps your local cycle planner has this information in a report? Please share links to your city's data in the comment section below so we can all benefit from it. The more proof bike-sharing is benefiting our cities, the easier it will be to launch programs in cities currently lacking a program as well as expand existing programs. Today the Cardiff, Wales City Council announced it will launch its bike-sharing scheme tomorrow with 70 bikes and 10 stations, according to the BBC and Wales Online. The system will be run by OYBike which has similar systems in London, Cambridge, Reading, and Farnborough in the U.K.
Last week the English resort city of Blackpool launched Hire-a-bike by Cycle Blackpool approximately the same size system as Cardiff's, but operated by Hourbike which has a small system in Bristol. The Guardian reports that Cycle Blackpool will grow the system to 500 bikes and 100 stations before next spring. Dublinbikes, the JCDecaux system started earlier this month as reported here, has had incredible success. With 1,000 riders on the first day and 6,000 riders the first week, according to the Independent, this 450-bike system has a respectable two trips per bike per day usage rate. These small bike-sharing roll outs all bode well for the next spring’s large London Cycle Hire scheme which you can read about here. 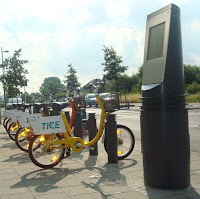 Three new and innovative bike-sharing systems began in the last few months in France. Unlike most French systems, these programs are not supported by street furniture advertising, but are municipally and/or transit company-owned and operated. All three have solar powered docking stations. 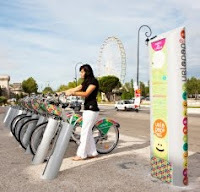 Vélopop in Avignon is a 200-bike program that uses the Smoove Key system. It is operated by TCRA, the public bus system in Avignon. Vélocéa in Vannes has 175 bikes in 20 stations and is owned by the municipal government. Vélo Bleu in Nice as first reported here, began with 900 bikes in 90 stations, and is owned by a regional government cooperative. It has high ridership, but says Metro, it is plagued by theft. Both these cities use the Veloway system. The new Rennes, Vélo STAR, though inaugurated this month, began service in June. Owned by the regional government, its 900 bikes have been used by 50,000 riders. The 80 stations are integrated with the subway and bus system in this Keolis operated system. Vélo STAR is around four times larger than the system it replaced as reported here. The small country of Luxembourg has a new and interesting bike-sharing system in the little city of Esch-sur-Alzette. Vël’OK has only 120 bikes and 15 stations. It is joint venture between a nonprofit group and the municipality. It plans on expanding to 300 bikes next year. It demonstrates bike-sharing is stationing in smaller communities outside of France, Germany, Britain, and Italy. The big news in Italy is that Turin will finally join the 41-city Bicincittà system this spring. It will start with 58 stations and might be called either “BikeTo” or “BicinTorino” according to Metro. Reuters is reporting that the municipalities of Greater Nicosia, Cyprus have agreed to launch a region-wide bike-sharing program soon. The RFID card service will cover the seven municipalities of Nicosia which include Aglandjia, Strovolos, Lakatamia, Latsia, Ayios Dometios, Engomi and the city centre. Clear Channel Outdoor has announced a new SmartBikes program in Kayseri, Turkey. Bixi is continuing its summer demonstration schedule into the fall. This weekend in Boston, MA for the Saturday professional bike race and the Sunday fun bike ride, there will be two bike-share demonstrations of Bixi. For more information see: Bike-sharing in Boston. 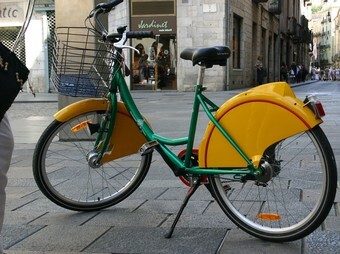 Girona, Spain, a Catalunyan town about an hour northeast of Barcelona, will be introducing its new bike-sharing service on September 25. The service is called Girocleta which is a combination of the name of the town and the word "bicicleta" or bicycle. Girocleta will provide a fleet of 160 bikes and 10 stations throughout town. Girona's Mobility Councilwoman, Elizabeth Salamano said, "The service is primarily intended for those who live outside the city and come every day to work or study." The manufacturer is TNT and the operator of the service is Icnita with supervision by Girona's Municipal Transport agency. The annual cost of operating the service is estimated to be $294,000 (200,000 EUR). What does the one of the world’s most bike-friendly cities do when it wants to upgrade its 2nd generation bike-sharing system to a modern 21st Century system? Well, all you bike-sharing geeks, consultants, vendors, manufacturers, and wannabe experts, here is your chance to pedal into the breakaway. Copenhagen is having a world-class International Design Competition to create a world-class bike-sharing system! The mayor of Copenhagen, Klaus Bondam, has put out the Invitation announcing, "In 1995, Copenhagen was the first city to introduce a modern bike share system – Bycyklen - or The City Bike. Much has happened since this Bike Share v. 1.0 was launched and, over the past ten years, many large cities now enjoy exciting, new bike share systems. From Barcelona to Beijing, a new generation of bike share systems have blossomed. To the delight of locals, tourists and commuters alike. Copenhagen is a unique, world-class cycling city and this fact should be reflected in the city’s bike share system. Our city is the best example of how the bicycle can become the preferred form of transport in a modern city. An attractive and modern bike share system can contribute to strengthening Copenhagen’s bicycle culture. Therefore The City of Copenhagen is pleased to launch an open design competition in order to determine how a bike share system v. 3.0 would look and work in the city in the future." Here are the rules and deadlines. You only have until mid-November to take this challenge! When other cities put out Request for Information or Request for Proposals for bike-sharing, Copenhagen keeps in forefront of world cycling with this International Design Competition. According to The Irish Times, on September 13, JCDecaux will be launching dublinbikes in Dublin, Ireland. As the country's premiere bike-sharing program, the program should consist of 450 bikes with 40 stations. The service will be available between the hours of 5:30 a.m. and 12:30 a.m. This could miss out on the roughly 25% of the uses Velib' receives during the night when other transit services are closed. With Dublin's population of roughly 507,000, the program's introduction of a fleet of 450 bikes will be significantly less than Paris' fleet of 20,600 in a city of 2,200,000. However, while thinking small, Jim Keoghan from the city council states, "We're hoping it is a success and it will be expanded." TreeHugger points out, "Dublin isn't widely recognized as a cycling city," however, they want to change this. The service's website notes that cycling "is up 30% in recent years and [dublinbikes] can only make it easier for people to make more sustainable transport choices." In addition, Transport Minister Noel Dempsey, a Green party member, has been keen on improving the city's cycling infrastructure and number of people commuting by bike" with a promise of €5 million being spent this year on cycling infrastructure improvements.